This was a tighter game than the margin of victory suggests. In the end, it was Wheatsheaf’s lack of enterprise and cutting thrust out wide which was the visitors undoing. For the first 20 minutes both sides slugged it out amongst the forwards. Wheatsheaf, which by far had the heavier pack, drove over from five metres out to take a 5-0 lead. Soon after the restart, Verwood were awarded a penalty 40 metres out. Paul McGuffie, playing an unaccustomed role at centre, slotted the penalty with ease. Wheatsheaf extended their lead on 30 minutes with another drive from five metres out, this time following a lineout. Soon after, Verwood were awarded a penalty on Wheatsheaf’s 10 metre line and elected to run. 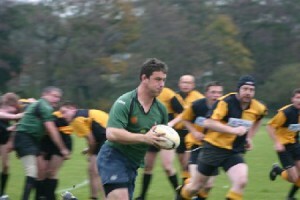 A ruck saw the ball recycled quickly and moved right. A well timed pop pass by Will Trim to his number 8, Richard Cooke, saw him hit the gap at pace. 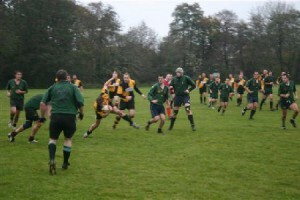 Cooke stretched his legs running 40 metres to score under the posts. McGuffie converted. Towards the end of the half, a lineout on half-way was poorly tapped back by Wheatsheaf. Verwood’s Cooke tore into ‘sheaf’s halfbacks intercepting a wildly thrown pass to run in again from 40 metres to score in the right hand corner. At this stage the game could still have gone either way. Wheatsheaf’s lineout was functioning efficiently, as was their scrum. Again from close range, this time a scrum 10 metres out, Wheatsheaf’s number 8, Rich Knight, broke right and rode a tackle to score in the corner – his third of the day. Then, the defining moment of the game. A poor clearance kick found Verwood’s fullback Karl Jeneson on halfway. The Zimbabwean set off on a mazy and powerful counter to set up a ruck on Sheaf’s 22. Two pairs of quick hands put replacement Charlie Cockram into space to run in unopposed. Into the final quarter and Wheatsheaf were noticeably tiring. Verwood were now picking up the tempo. Straight from the restart, a clever kick into space by Cockram saw speedster Matt Moore gather the ball and rip it free from his opponent. He then accelerated away to score under the posts. McGuffie converted. Verwood perhaps kept the best to last. From a scrum deep in their half the ball was moved swiftly to outside centre Matt Pike. A show of the ball was enough to open up a gap which he accelerated through. With Cockram on his left shoulder he drew the fullback to provide Cockram with a clear run in. McGuffie converted.